Watching people jump from a height of 16 stories (160ft/50m) almost makes you want to do it too….ALMOST. I wish a fortune teller could reveal to me if I’ll ever muster up enough courage to plunge off a platform with a rubber band around my ankles. Until then, rubber bands tied on me are strictly for ponytails. After Brisbane, Shane and I and his parents joined more of his family and their friends and increased our group number to 8 Americans in Australia. 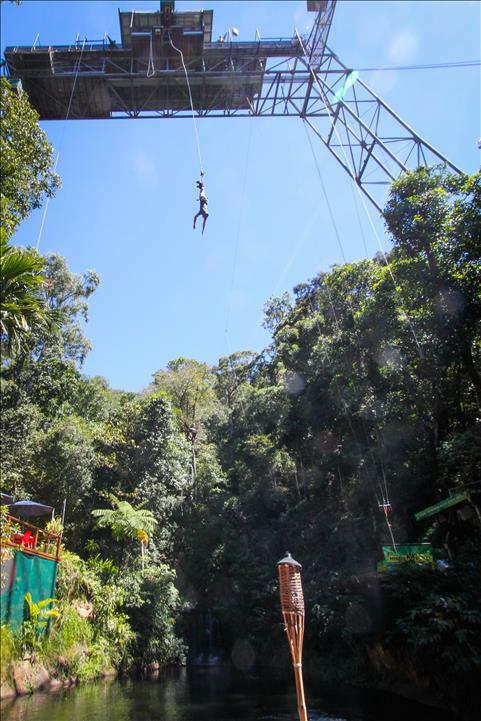 Whereas most siblings have a traveling tradition of fighting, Shane and his brother have a traveling tradition of bungee jumping; so that immediately made its way onto our traveling itinerary in Cairns. 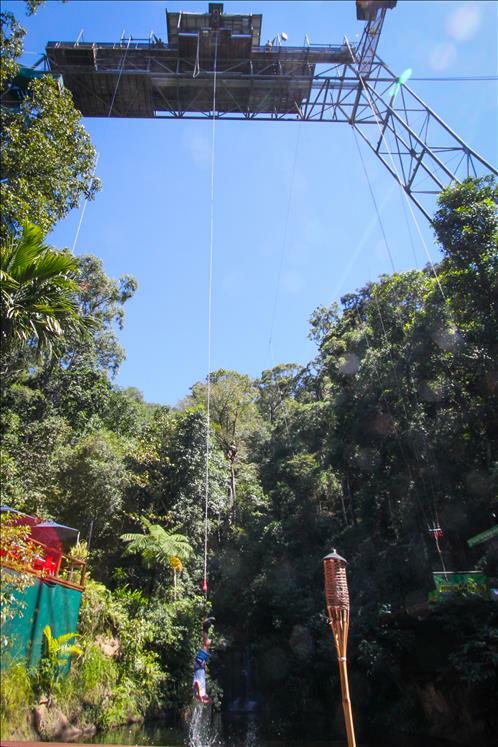 They selected AJ Hackett (luckily not AJ Hack it) Bungee Jump Cairns as their destination and made their way into the Australian rain forest to the bungee base surrounded by lush tropical foliage: an extremely beautiful place to cheat death. Watching your boyfriend plummet 160 feet through the air is something most girlfriends only dream of after a fight, but I got to actually see it happen. Arms spread flying through the air he looked like superman; only falling instead of flying and not as well dressed with a sad lack of cape. In a few seconds it was over and he was dangling like a helpless spider over a pond waiting to be taken out of the gear. I wish I was brave enough to experience the adrenaline rush of some time free falling through the air. For a long time the feeling of free falling was something people only experienced right after an unfortunate series of events and right before a tragic death. Modern humans have the ability to manipulate near death experience into a novelty. You can even choose to be dunked in the water at the climax of your fall. Bungee is a truly fascinating thing to watch. On one hand you admire the person flying off a stationary platform into open air; fearlessly doing something that could kill them. On the other hand you wonder if they’re crazy, mad, daft, stupid or suicidal. Should I put bungee jumping on my bucket list? 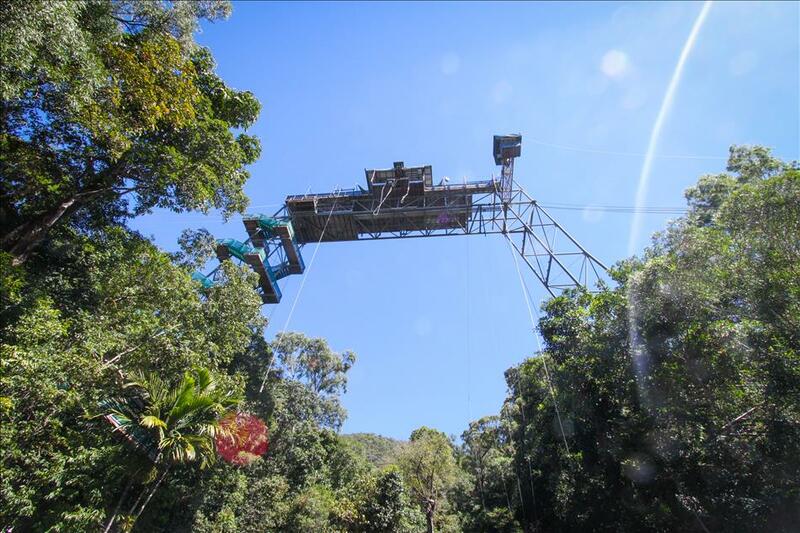 Great to read your experience as the viewer of a bungee jumper. My daughters both had a skydiving experience together that was a lot of fun, plus they got videos and pictures which was part of the package, so we all got to laugh and enjoy that experience together in that way….Maybe that is something that you might try…. Maybe, I really hope I can in the future. I am just really insanely afraid of heights which would make it all that more exhilarating to get over. Your daughters sound awesome!! Skydiving would be a whole other adventure!! Great perspective and story telling. You’re too quite over there – write more!